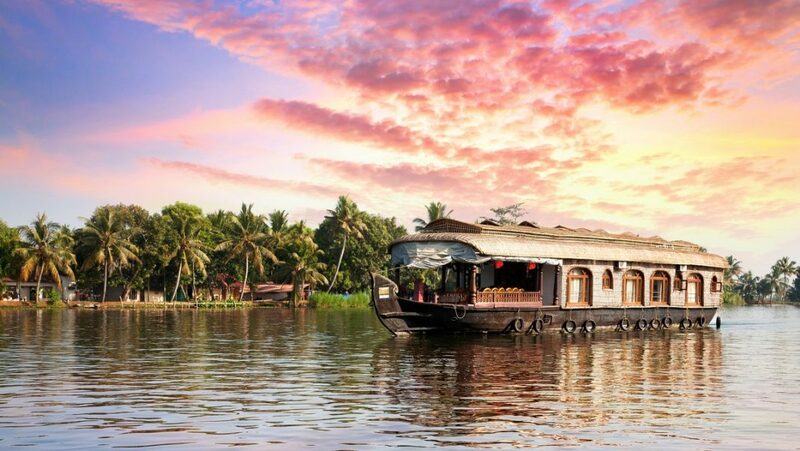 Located on the southwestern coast of India, Kerala is famous for its natural beauty. Its rich culture, lush green hills, serene backwaters and pristine beaches make it easy to see why it’s often called ‘God’s Own Country’. Sandwiched between the Arabian Sea and the Western Ghats, there are lots of places to visit in Kerala. 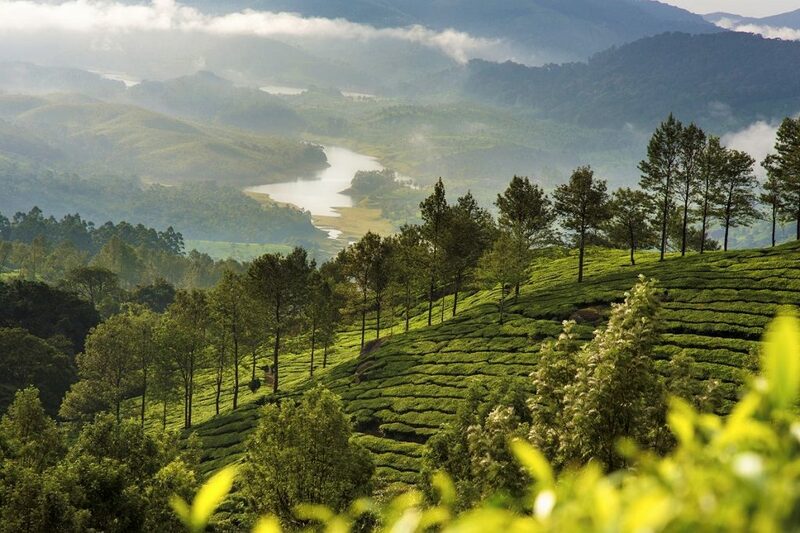 Kerala is also famous for its spice and tea plantations, and for its Ayurvedic treatments and delicious cuisine. It also has vibrant traditions and festivals. 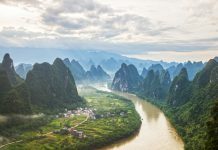 Home to a diverse range of flora and fauna, it is one of the top destinations in South India, as well as one of the most laid-back places in the country. Kerala is well connected to all the other Indian states through all types of transport. 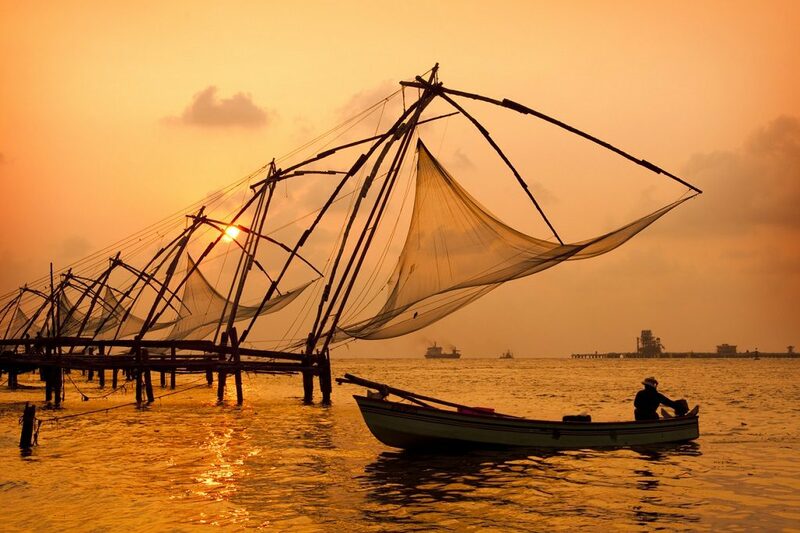 Sunset over Chinese Fishing nets and boat in Kochi, Kerala, India. Kerala’s major airports are at Trivandrum, Kochi, Kannur and Kozhikode. They serve both international and domestic routes. All of them have regular shuttle services to and from the city. The state is well connected by train, particularly along the west coast. Almost all trains in Kerala originate or terminate in Thiruvananthapuram or Kochi. You can also check out the luxury tourist train The Golden Chariot which covers many parts of South India and starts in Bangalore. Many National Highways run through Kerala, and both private and government inter-state buses connect to the nearby states. There are also some long-distance buses that come here. As most of Kerala is set along the coast, it has many major ports. Kochi is one of the busiest cruise ports in India. Trivandrum also has an extremely busy port. Many top international cruises, as well as ones from Mumbai or Goa, stop here. There are lots of wonderful natural sites and fascinating historical places to see in this diverse state. Here are some of the places to visit in Kerala. Periyar Tiger Reserve — this lush national park at Thekkady was initially preserved by the Maharaja of Travancore as a game reserve in the 1930s, and is home to elephants, langur monkeys and tigers. The Backwaters – a network of canals with unique flora and fauna through Alleppey, Kumarakom, Kollam, Kasaragod and Kuttanad; visitors can rent canoes or houseboats to explore them. Munroe Island — also called Mundrothuruthu, this island is set between Ashtamudi Lake and the Kallada River. It is known for its coconut farms, mangroves and the historic Dutch Church. Wayanad— this town is a haven for wildlife lovers. They can visit the Muthanga Wildlife Sanctuary, ride along the Kabini River, or explore the Edakkal Caves. Kovalam — this bustling seaside town is a popular destination. You can also visit nearby Bekal, with its 40-acre fort. Varkala — a town known for cliff-lined beaches with extraordinary views. It also has lively shacks and cafes and a Portuguese era fort. Kumarakom – this village on the Vembanad Lake is one of the top bird sanctuaries which is home to tons of residential and migratory birds. Athirapally Waterfalls – located in the Thrissur district near the Sholayar range, this is the largest waterfall in Kerala. It falls into the Chalakudy River. Fort Kochi— a historic destination known for its melting pot of cultural sites, among these are the Jewish Synagogue, Dutch Palace, the tomb of Vasco da Gama, Santa Cruz Basilica, Chinese tiles, Belgian chandeliers, as well as the Fort Kochi beachfront. Guruvayur — home to the Guruvayur Sri Krishna Temple, when an annual elephant occurs during a religious festival. The elephants can be found at the Punnathur Ana Kotta palace grounds. 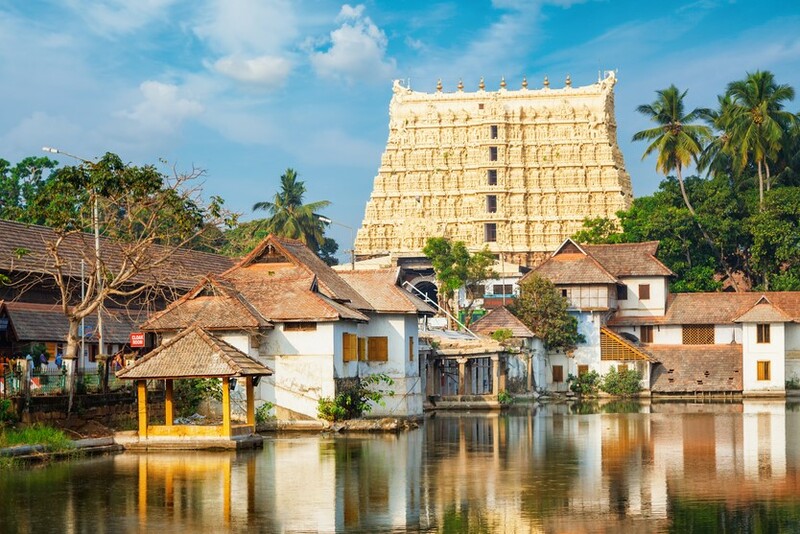 Padmanabhaswamy Kshetram — located in Thiruvananthapuram, it said to be the richest temple in the world. You can also visit the many nearby temples nearby, such as Koyikkal Palace, Kanakakunnu Palace, Nanthancodu and more. Edakkal Caves — a series of prehistoric caves that are home to petroglyphs that are almost 8,000 years old, that depict humans, animals, and tools. 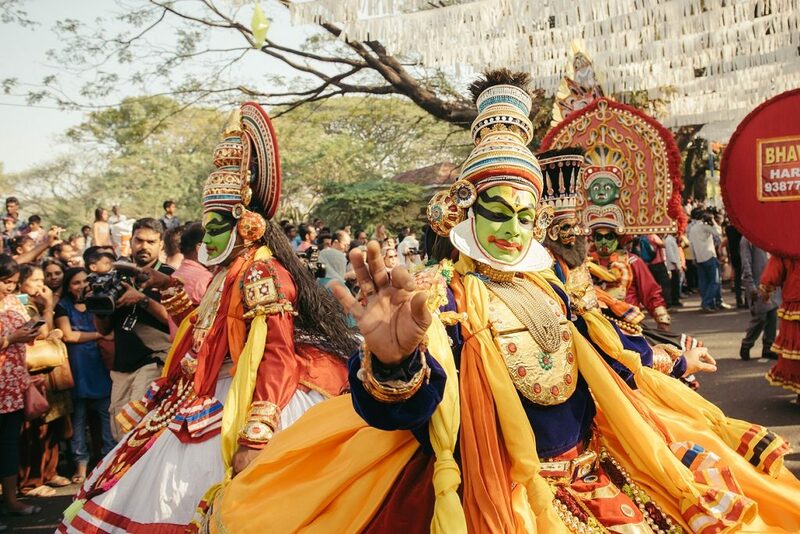 Music, Art and Dance: Kerala’s cultural heritage is quite unique especially the famous Kathakali dance which features elaborate makeup and costumes, and Kalaripayattu, a traditional martial art. There is also Chakyarkoothu a form of comedy satire, Mohiniyattam, a 16th-century classical dance, and Theyyam, a traditional form of worship that includes dance. Local food: The food of Kerala is quite unique. This coastal state is known for its seafood, such as fish molee, prawn curry, as well as Erissery, Nadan Kozhi Varithathu, Idiyappam, Puttu and Kadala Curry. You can also try the Kerala sadya, a traditional vegetarian meal served on a banana leaf, especially during festivals and weddings. 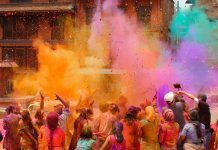 Celebrations and Festivals: Kerala enjoys lots of festivities and celebrations during the year, they include the Kerala boat festival (July-September), Onam (August-September), a 10-day harvest festival, and Theyyam (April-December), an 800-year-old ritual dance. The best time to visit Kerala is during one of these festivals. The state enjoys pleasing weather throughout the year, but the peak season is between September and March when the weather is not too hot. Summer lasts between March and May and can get quite hot, while the monsoon is between June and August.